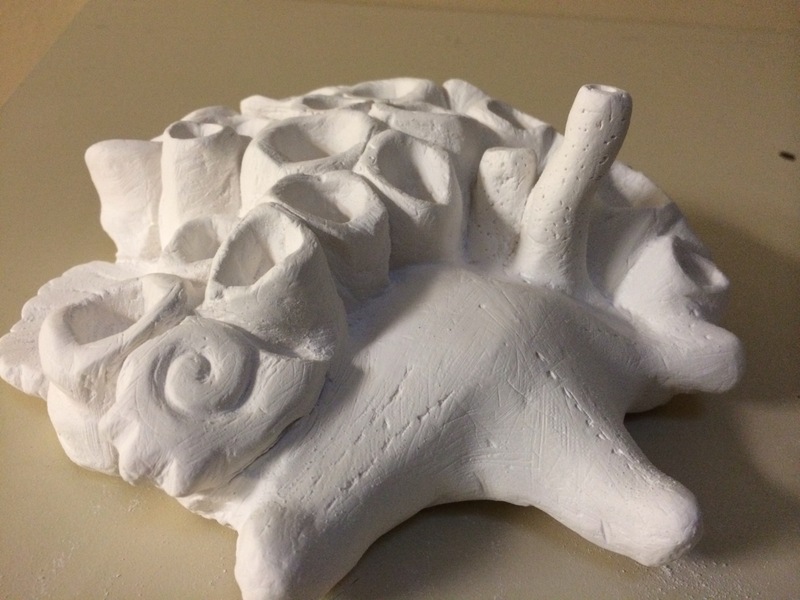 This is sculpture I created to represent industry taking over the environment. 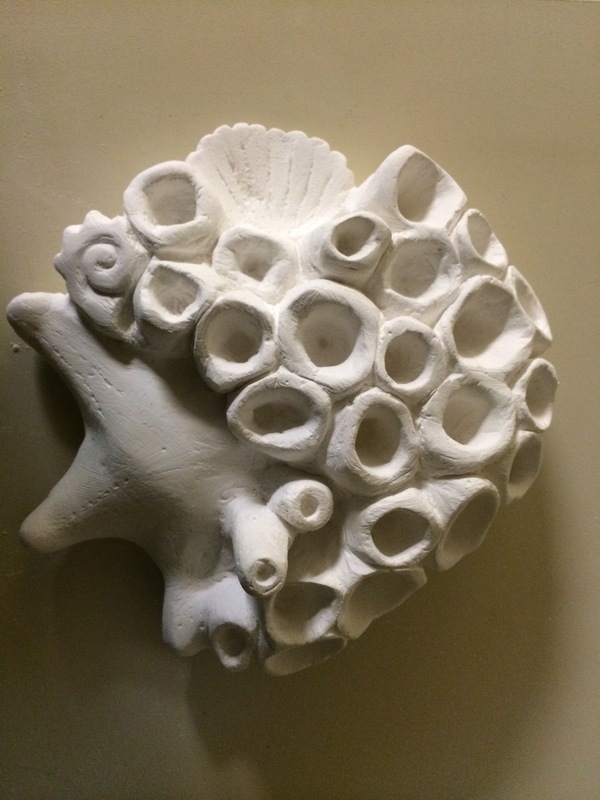 The sculpture of the shell, starfish and barnacles represents nature, its beauty and its dependence on each other for survival. The wooden sculpture is formed of several wooden gears, representing human development. 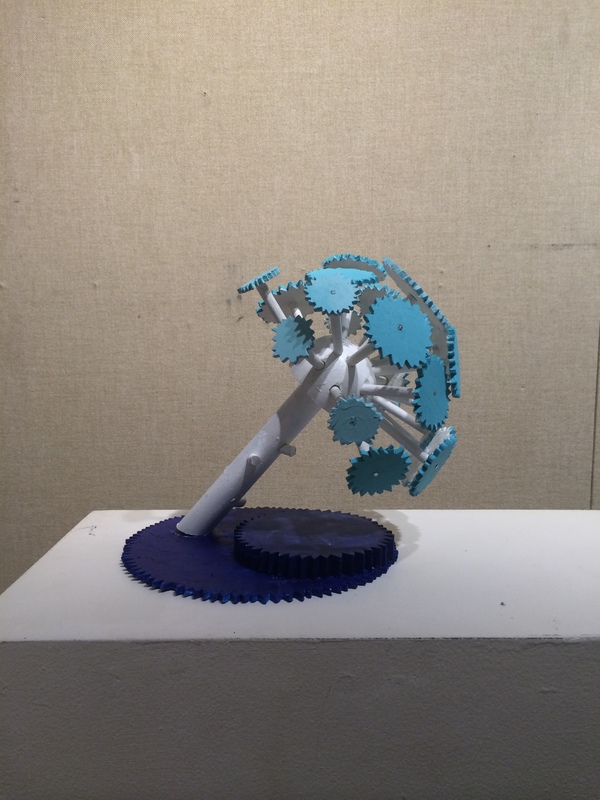 The gears form a large overshadowing umbrella that almost put nature at the risk of being destroyed. However, there exists irony in the fact that the industrial representation is made by a natural product, wood, and the natural representation is sculpted from manufactured plaster. 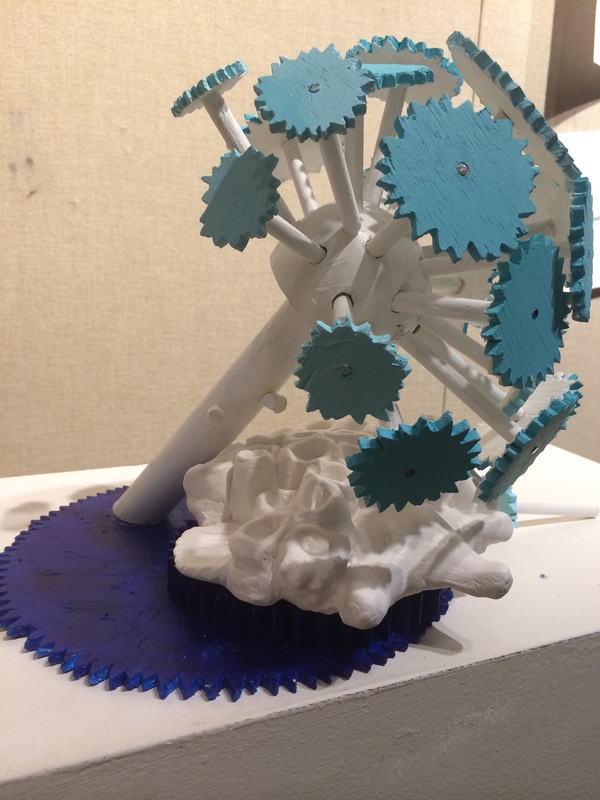 The fact that the barnacles and gears are both arranged in circular, airy patterns help the visual display so that the two sculptures fit well together. 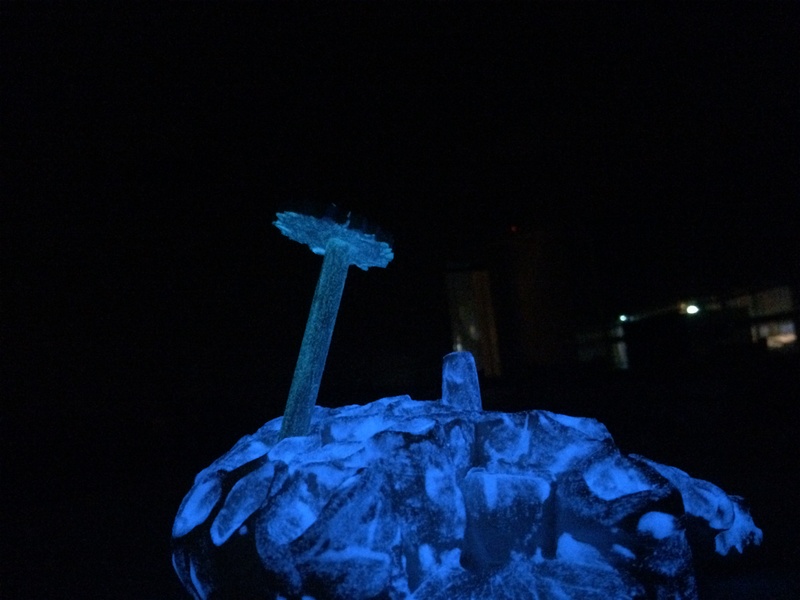 The glow-in-the-dark luminescence is used for the aquatic theme. The presence of a gear fallen into the barnacles, show that the impact of industries is already felt on natural organisms. 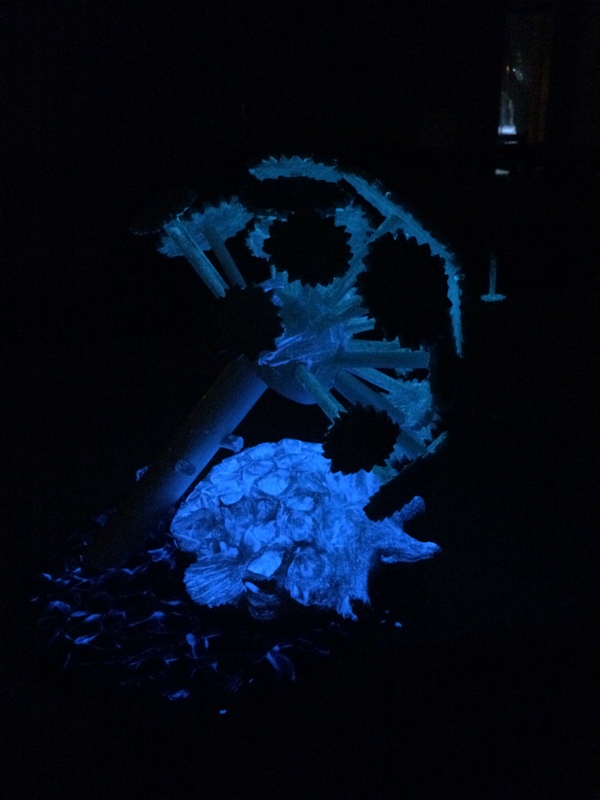 Furthermore, the blue color and anemone-like shape of the gears reflects the invisibility of some human harm on nature, as it blends in with the natural blue color of the sea and shapes of ocean species. For example, the millions of plastic beads that are used in face washes and scrubs seep into the ocean and are ingested by aquatic organisms without showing a visual impact on them. Similarly, fertilizers leaching into lakes cause eutrophication, which leads to high outbreak of algae in waterbodies, and eventual death of all lake species due to lack of dissolved oxygen. These processes show effects in growth of organisms, and hence become part of natural processes, slowly destroying them. This sculpture is meant to make the viewer feel the weight of human impact onto the environment through its design, materials, color and display.